Bing Crosby was a Northwest icon long before Jimi Hendrix, Kurt Cobain and Eddie Vedder sang their first tunes. And though he may seem about as hip today as grandmother’s Sutter Home white zinfandel, Der Bingle was a trailblazer who practically invented the art of crooning, inspiring such stars as Dean Martin, Perry Como and Elvis Presley. Collectors’ Choice Music and the Bing Crosby Archive are releasing six packages of Crosby recordings due in stores May 18. 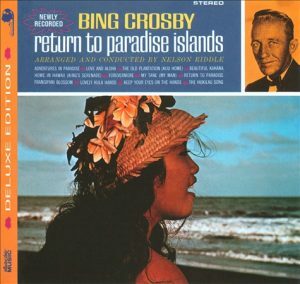 Among my favorites is “Return to Paradise Islands” (Deluxe Edition),” which Crosby recorded in 1963 — at age 63. It was the last of his Hawaiian-themed albums, with songs arranged and conducted by the incomparable Nelson Riddle. Despite the Lawrence Welk-ian pace of some of these tunes, there’s a bachelor-pad coolness that’s strangely intoxicating. The 18-song collection (six are bonus tracks) includes such gems as “The Hukilau Song” (a tribute to the beach-side feasts immortalized in Presley’s 1961 movie, “Blue Hawaii”), “The Old Plantation,” “Lovely Hula Hands,” “Adventures in Paradise” (remember the TV series with Gardner McKay? No, you’re probably too young), “Frangipani Blossom” and “My Little Grass Shack (in Kealakakua, Hawaii).” OK, so this isn’t the hippest collection in the CD universe. But the songs are beautiful, with lush orchestral arrangements, melodies as breezy as a day at the beach and the wonderfully laid-back, burbling vocals that made the Northwest native famous. There’s also a great sense of history in these recordings; Crosby — born in Tacoma, raised in Spokane — was a star of great magnitude, at a time when few artists achieved such a level of fame or had such influence on the development of popular music. Bonus tracks were added by Crosby archivist Robert Bader; five of them are from a radio series Crosby recorded with singing pal Rosemary Clooney. “Return to Paradise” is one of a brace of new releases highlighting Crosby’s lengthy career. They include “Bing Crosby: Seasons (Deluxe Edition), his final album, released in the 1977; “Bing Crosby: On the Sentimental Side (Deluxe Edition),” “Bing Crosby: Bing on Broadway,” “Bing Crosby: El Senor Bing” and “Bing Crosby: So Rare — Treasures From the Crosby Archive” (a two-CD set). “Bing on Broadway” and “So Rare” are entirely new collections. “On the Sentimental Side” is previously unreleased. The albums coincide with a special on Crosby currently airing on PBS. If you’re a Crosby buff, look for more releases in the next two years from Collectors’ Choice — in the form of additional albums featuring rare or previously unreleased songs and new compilations of Crosby’s TV and film appearances. Here’s a link to the Collectors’ Choice Music Web site. Wanna read more about Crosby? Here’s my 2003 story about the singing star featuring an interview with his grandson, Steve Crosby (my apologies for the mispelled headline; it’s just a typo). And check out the terrific Bing Crosby Web site here. And here’s an interesting recollection by Tom Camfield about his encounter with Crosby in 1955, while Camfield was working as a young reporter for the Port Townsend, Wash., newspaper. For a link to my Archives page, click here.